When Simon Fenwick, a professional archivist, was asked to sort Paddy’s papers at Kardamyli after his death in 2011, one would imagine that it would be the illustrious Paddy who would fire Simon’s imagination to write a book. But, as Simon worked his way through the accumulations of a lifetime, it was Joan, the woman who lived in Paddy’s shadow who started to fascinate and inspired him to write Joan: Beauty, Rebel, Muse: The Remarkable Life of Joan Leigh Fermor . Although Joan’s money enabled Paddy to write, and she accompanied him on many of his post-war journeys, there is barely a mention of Joan in Paddy’s work. Simon’s painstaking research has resulted in a thoroughly enjoyable biography that gives Joan real shape and depth. Not only has Simon managed to produce a book about a woman who barely left any archive of her own (a diary from 1936 and some letters from John and Penelope Betjeman is about it), he has a very engaging and entertaining style. Paddy of course features prominently in the latter half of the book, but Simon is careful to retain the focus on his subject. We do, however, learn a lot more detail about Paddy to supplement Artemis Cooper’s 2012 biography Patrick Leigh Fermor: An Adventure . Simon has had the benefit of access to a very wide range of different source information, and dare I say, material that now is much better organised than when Artemis was writing. Simon Fenwick is very candid about the lifestyles and affairs of Joan, Paddy and their assorted friends. It was Joan who was friends first with Cyril Connelly, Maurice Bowra, John Betjeman, Patrick Kinross etc, and introduced Paddy into their world where he found immediate acceptance. There is a degree of honesty about his work which will appeal to those who want to know what the lives of these people were really like. We may think that we know them, but Simon Fenwick truly brings a new perspective and introduces us to new material. It is certainly a good read, and in paperback, an ideal stocking filler for Christmas. This entry was posted in Uncategorized and tagged Joan Leigh Fermor, Simon Fenwick on December 2, 2018 by proverbs6to10. In late September the Benaki museum carried out an extraordinary publicity drive in London in an attempt to counter the ongoing criticism of its tenure of the house and progress with renovations. On 26 September I attended an event at the Hellenic Centre which was, I am told, similar in content to an exclusive evening held the night before at the Traveller’s Club. After an extraordinary period of silence, like an old boxer absorbing the body-blows of criticism for many rounds, the Benaki came out with all guns blazing in an attempt to explain how things were now really moving with the house project. No less than two of Her Majesty’s former Ambassadors to the Hellenic Republic were on the five person panel to ensure that we agreed it must be so. To make sure we were in the right mood, we were first treated to the Benaki promotional video which portrays the museum as one of the most important cultural institutions in Greece, and indeed it certainly has a fine collection and many responsibilities including looking after the house of Nikos Ghika, which must be where Paddy and Joan got the idea in the first place. I encourage you to watch it here. Irini Geroulanou, a member of the Executive Board of the Benaki, explained the details of the bequest and ran us through the events that have taken place since Paddy’s death six years ago. We do have to appreciate the serious financial circumstances that have existed in Greece and some of the tortuously slow bureaucratic steps that needed to be taken to secure permission to work on the house. Key events were the 2015 business plan for the house produced by AEA Consulting which outlined how the Benaki could make it self-funding, and the 2016 donation by the Stavros Niarchos Foundation which at last made money available to commence the works. Ms Geroulanou went on to show glimpses of plans but, curiously, only a very few photographs of work on the house. The intention is to create five independent “units” including a work area and en-suite facilities to foster privacy, focus and creativity. A Common area will be centred on the “world’s room”. Winter will be a maintenance period; in the spring there will follow two months of academic residence; there will be two periods in the late spring and early autumn for “Honorary fellows” to use the house as the writers’ retreat that Paddy foresaw; in the summer, three months will be set-aside for holiday rentals, this forming the main part of the annual income. The house will become known as The Patrick and Joan Leigh Fermor Centre, and the Benaki plans to start a charity in the UK to create a dedicated endowment fund. This was all very encouraging. But, as I say there were very few pictures showing actual progress at the house. Apparently the roof is being replaced but workers were reluctant to be photographed. The museum would do itself a lot of favours if it were to publish regular updates, with a few photographs on the House section of its website. Ms Geroulanou also made time to counter the criticism made against the Benaki. She was passionate and very detailed in her rebuttal – countering the reports that had apparently appeared in newspapers (so not this blog then!) that donations had been turned down – giving us a detailed breakdown of all three or so donations which seemed to add up to the value of a good night out at a taverna in Kardamyli. There were other mentions of criticisms on “websites and blogs” (OK – guilty) which seemed to have struck hard at the Benaki, leading to “an unpleasant climate of suspicion”. I stand by the criticism I made a year ago about a lack of care of many of the smaller items in the house, but that is all now in the past. It is encouraging to report that things are now happening. It is also good to know that the Benaki is a distinctly reputable and experienced organisation, and now with the funding it has, Paddy and Joan’s vision may be achieved within 18 months or so. I look forward to updating you on progress, as I also look forward to the Benaki sharing plans, reports, updates and photographs on its website so that the nasty “unpleasant climate of suspicion” does not return. PS – apologies for the delay in posting this update. I have been working very hard, and away for a time on a personal pilgrimage on foot from Winchester to Exeter via Salisbury, Wells and Glastonbury. I encourage others to go! I can supply my route information. This entry was posted in Paddy's Houses and tagged Benaki Museum, Joan Leigh Fermor, Patrick Leigh Fermor on October 21, 2017 by proverbs6to10. Some of you may remember that Simon Fenwick was the archivist who was first tasked by Paddy’s estate to make an initial pass at cataloguing his personal effects and papers. I have bumped into Simon on a few occasions since Paddy’s death. In conversation he has told me that he is working on a book about Joan Leigh Fermor from her own papers and diaries, and one that will give us a very different perspective on Paddy and their life together. It promises to be somewhat revelatory. You asked for an insight into their private life. Well, when they met Paddy may have been an officer but it took Joan to make him a gentleman. Paddy was totally undomesticated and remained so. He flooded baths and spilt drinks over sheets. He also smoked 100 a day, habitually set the bed on fire and woke up in clouds of smoke. In one of his letters Evelyn Waugh refers to Paddy and Joan as ‘the Nicotine Maniac and his girl’. Not unnaturally Joan and he had separate bedrooms although hers was invariably covered in cats which he wasn’t keen on. I suppose Paddy was quite a good advert for the fact that smoking doesn’t always kill you. Further details of Simon’s book will be available here on the blog in the coming months. Information about the Transylvanian Book Festival can be found here. This entry was posted in Transylvanian Book Festival and tagged Joan Leigh Fermor, Simon Fenwick, Transylvanian Book Festival on May 21, 2016 by proverbs6to10. It often takes me quite a while to post items that have been very kindly sent to me by some of our many readers. This is just one such example and I have to apologize as I have lost the details of whoever sent it to me. Suffice to say that the content on here is often the result of your hard work in finding items and sending them to me so please do keep it up and I will always acknowledge your contribution. This is unique example of being unable to do that. If you sent me the original link and are reading this please step forward! PS – the mystery contributor has been found. Thank you Rob MacGregor! Below is an extract from Neville Phillip’s 2008 biography The Stage Struck Me! in which he mentions an amusing episode involving Paddy at the shops! Can you imagine him shopping? “The Stage Struck Me!” is a funny, informative and sometimes sad account of the life of a jobbing actor and writer in the 1940s and 1950s, full of anecdotes about the famous, the infamous, the charming and the downright loopy people he met along the way. After joining the South African Army and serving as a gunner in the coastal artillery, Neville Phillips was transferred to the entertainment unit where he spent four years doing shows for the Allied troops in North Africa and Italy. In 1946 he was demobbed to London and it was here that Neville Phillips met and got to know some truly remarkable people, as well as writing West End reviews, pantomime, cabaret, and a musical starring Pat Kirkwood. “The Stage Struck Me!” is a fascinating and sometimes poignant account of times, places and people that played such an important part in a young aspiring actor’s life. Read the extract in pdf format here. This entry was posted in Paddy's Friends and tagged Joan Eyres Monsell, Joan Leigh Fermor, Neville Phillips, Patrick Leigh Fermor on April 8, 2014 by proverbs6to10. If you never get the chance to visit Paddy and Joan’s house in Karadmyli, it looks like you can have an extended viewing if you go to see the movie Before Midnight. This entry was posted in Paddy's Houses, Video and tagged Before Midnight movie, Ethan Hawke, Greece, Joan Leigh Fermor, Julie Delpy, Kardamyli, Patrick Leigh Fermor, Peloponnese on May 2, 2013 by proverbs6to10. 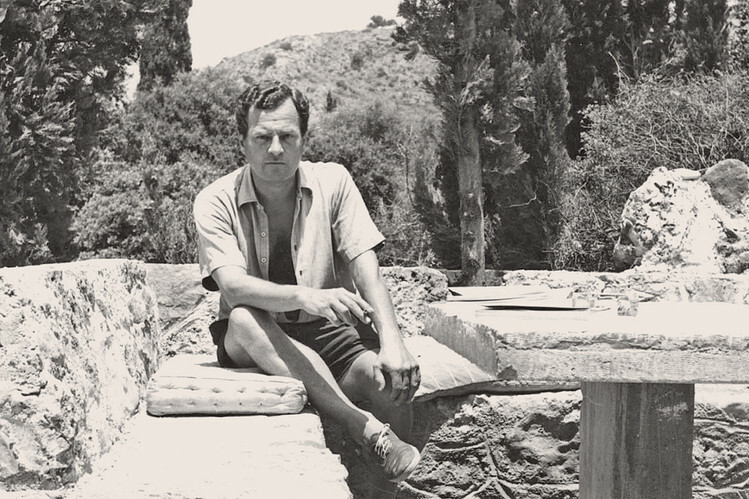 War hero, self-made scholar and the greatest travel writer of his generation, Patrick Leigh Fermor lived on a remote peninsula in the Peloponnese until his death in 2011. From a humble house he built himself, now being restored by an Athens museum, he explored Greece’s romantic landscape—and forged a profound link to its premodern past. First published in the Wall Street Journal Magazine 27 September 2012. 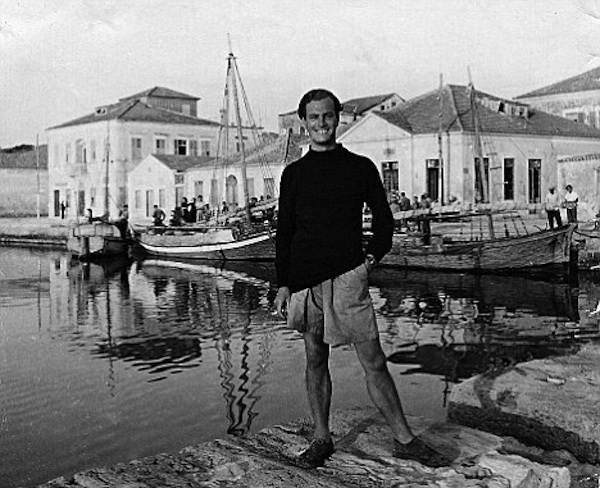 A famous anecdote, told by Patrick Leigh Fermor himself in his book Mani, relates how on one furnace-hot evening in the town of Kalamata, in the remote region for which that book is named, Fermor and his dinner companions picked up their table and carried it nonchalantly and fully dressed into the sea. It is a few years after World War II, and the English are still an exotic rarity in this part of Greece. There they sit until the waiter arrives with a plate of grilled fish, looks down at the displaced table and calmly—with an unflappable Greek stoicism—wades into the water to serve dinner. Soon the diners are surrounded by little boats and out come the bouzouki and the wine. A typical Fermor evening has been consummated, though driving through Kalamata today one has trouble imagining the scene being repeated. The somniferous hamlet of the far-off 1950s is now filled with cocktail bars and volleyball nets. The ’50s, let alone the war, seems like another millennium. Fermor, or “Paddy,” as many educated Greeks knew him, died last year at the age of 96. He is remembered not only as the greatest travel writer of his generation, or even his century, but as a hero of the Battle of Crete, in which he served as a commando in the British special forces. “For as long as he is read and remembered,” Christopher Hitchens wrote upon Fermor’s death, “the ideal of the hero will be a real one.” Hitchens placed Fermor at the center of a brilliant English generation of “scholar warriors,” men forged on the battlefields of the mid-century: This included poet John Cornford, martyred in the Spanish Civil War, and the scholar and writer Xan Fielding, a close personal friend of Fermor’s who was also active in Crete and Egypt during the war, and a guest of the aforementioned dinner party. When Fermor said Fielding was “a gifted, many-sided, courageous and romantic figure, at the same time civilized and bohemian,” he could have been describing himself. But Fermor was a man apart. Born in 1915 into the Anglo-Irish upper class—the son of a famous geologist—Fermor, literally, walked away from his social class and its expectations almost at once. At 18, he traveled by foot across Europe to Constantinople—a feat later recorded in his books A Time of Gifts and Between the Woods and the Water. In the ’30s he traveled through Greece, mastering its language and exploring its landscapes with meticulous attention. He fell in love with a Romanian noblewoman, Balasha Cantacuzene (a deliciously Byzantine name), and the outbreak of war found him at her family estate in Moldavia. After the war, now decorated for his heroism, Fermor settled in Greece. He and his wife, Joan Rayner, a well-traveled Englishwoman whom he’d met in Cairo, built a house just outside the village of Kardamyli, a few miles down the jagged coast from Kalamata, in the wild and remote Mani. It was a place that, even in the early ’60s, almost no one visited. “Homer’s Greece,” as he put it admiringly. “It was unlike any village I had seen in Greece,” he wrote in Mani. “These houses, resembling small castles built of golden stone with medieval-looking pepper-pot turrets, were topped by a fine church. The mountains rushed down almost to the water’s edge with, here and there among the whitewashed fishermen’s houses near the sea, great rustling groves of calamus reed ten feet high and all swaying together in the slightest whisper of wind.” It was timeless. Kardamyli, indeed, is one of the seven cities that Agamemnon offers a scowling Achilles as a reward for his rejoining the paralyzed Achaean army at Troy in The Iliad. The house, still largely untouched from when Fermor lived there, was bequeathed to the Benaki Museum in Athens. As I walked through it alone during a visit there this spring, it reminded me in some ways of Ian Fleming’s Goldeneye in Jamaica, a spartan but splendidly labyrinthine retreat devoted to both a productive life and to the elegant sunset cocktail hour. In one bedroom stood a set of Shakespeare volumes with painstakingly hand-penned spines; on a wall, a painted Buddhist mandala. In the living room there were faded wartime photographs of Fermor on horseback, armed and dressed like a Maniot. The whole house felt like a series of monastic cells, their piety replaced by a worldly curiosity, an endless warren of blackened fireplaces, bookshelves and windows framing the sea. Fleming and Fermor were, perhaps predictably, close friends. Fleming’s Live and Let Die freely quotes from Fermor’s book about the Caribbean, The Traveller’s Tree. It was Fermor who made Fleming (and, of course, Bond) long for Jamaica. But where Fleming retreated to Jamaica to knock out six-week thrillers, Fermor lived in his landscape more deeply; he explored with dogged rigor its ethnography, its dialects, its mystical lore. His books are not “travel” in the usual sense. They are explorations of places known over years, fingered like venerable books and therefore loved with precision, with an amorous obsession for details. Standing on Fermor’s terrace, with its fragments of classical sculpture and its vertiginous view of a turquoise cove of stones, I felt as if the inhabitants of 40 years ago had momentarily gone inside for a siesta and would soon be out for a dusk-lit gin and tonic. It seemed a place designed for small, intimate groups that could pitch their talk against a vast sea and an even vaster sky. It also had something neat and punctilious about it. While sitting there, I could not help remembering that Fermor had once sternly corrected Fleming for a tiny factual error in his novel On Her Majesty’s Secret Service. Didn’t Fleming know that Bond could not possibly be drinking a half bottle of Pol Roger? It was the only champagne, Fermor scolded, never sold in half bottles. It was exactly the sort of false note that Paddy never missed, and that the creator of Bond should not have missed either. Truth for Fermor lay in the details, and his books show the same straining eye for the small fact, the telling minutiae. I noticed, meanwhile, a handsomely stocked drinks cabinet inside the house, in the cool, cavernously whitewashed living room lined with books—the selection dominated by a fine bottle of Nonino grappa. On the mantelpiece stood a card with the telephone numbers of his closest friends, Artemis Cooper (whose biography of Fermor is being published this month) and Deborah Mitford, later the Duchess of Devonshire. Fermor had been at the heart of many aristocratic circles, including those of the notorious Mitford sisters. The youngest of the Mitfords—”Debo,” as she was known—became Fermor’s lifelong intimate and correspondent. Their polished and witty letters have recently been published in the book In Tearing Haste. He was a frequent visitor at her country estate, Chatsworth, and the two were platonically entwined through their letters well into old age. They were, however, strange epistolary bedfellows. The Duchess hated books (“Quelle dread surprise,” she writes upon learning that a famous French writer is coming to dinner), while Fermor was the very definition of the dashing, encyclopedic gypsy scholar. In one letter the Duchess boasts that Evelyn Waugh gave her a signed copy of his latest book, which turned out to have blank pages throughout; he knew she hated reading. But the gardening-mad Duchess slyly understood all her correspondent’s erudite gags. Their gossip was gentle and civilized, and underneath it flowed a kind of unrequited love. In his first letter of the collection, written in 1955 from Nikos Ghika’s house on Hydra, Fermor proposes having himself turned into a fish by a young local witch and swimming all the way from Greece to Lismore Castle in Ireland, where the Duchess was staying. The Mani, meanwhile, was a far cry from English country houses and fox-hunting parties. Its remoteness and austerity—especially immediately after the war—were truly forbidding. As Fermor pointed out, this was a place that the Renaissance and all its effects had never touched. It was still sunk in Europe’s premodern past—a place still connected by a thousand invisible threads to the pagan world. Above Kardamyli rise the Taygetus range and the forests that Fermor loved to wander. Steep paved footpaths called kalderimi ascend up into half-abandoned villages like Petrovonni and, above it, the church of Agia Sophia, which looks down on the Viros Gorge. In Mani Fermor remembers that it was here, near the city of Mistra, that Byzantium died out a few years after the fall of Constantinople, and where the continuously creative Greek mind lasted the longest. It is a delicate, luminous landscape—at once pagan and Christian. Fermor discovered that Maniots still carried within them the demonology of the ancient world, filled with pagan spirits. They called these spirits the daimonia, or ta’ xotika: supernatural beings “outside” the Church who still—as Nereids, centaurs, satyrs and Fates—lived in the streams and glades of the Mani. They still believed in “The Faraway One,” a spirit who haunted sun-blazing crossroads at midday and who Fermor deduced to be the god Pan. The Mani was only Christianized, after all, in the 10th century. Fermor also described how an illiterate Greek peasant, wandering through archaeological museums, might look up at ancient statues of centaurs and cry, immediately, “A Kallikantzaros [centaur]!” To him, it was a living creature. I hiked up to Exohori, where Bruce Chatwin had, 25 years ago, discovered the tiny chapel of St. Nicholas while he was visiting Fermor. (I had, in fact, been given Chatwin’s old room in the hotel next to Fermor’s house.) Chatwin venerated the older writer, and the two men would walk together for hours in the hills. Fermor, for his part, found Chatwin enchanting and almost eerily energetic. Yet Chatwin was inspired not just by Fermor but by where he lived. When Chatwin was dying, he converted to Greek Orthodox. It was Fermor, in the end, who buried Chatwin’s ashes under an olive tree next to St. Nicholas, in sight of the sea of Nestor and Odysseus. Exohori felt as deserted as the other strongholds of the Mani, its schools closed and only the elderly left behind. It possesses an atmosphere of ruin and aloofness. I remembered a haunting passage from Mani in which Fermor describes how villagers once scoured out the painted eyes of saints in church frescoes and sprinkled the crumbs into the drinks of girls whom they wanted to fall in love with them. So, one villager admits to Fermor that it wasn’t the Turks after all. As a former guerrilla of the savage Cretan war, Fermor felt at home here. It was a thorny backwater similarly ruled by a warrior code. Its bellicose villages were, almost within living memory, frequently carpeted with bullet casings. It was a vendetta culture. The Mani was for centuries the only place in Greece apart from the Ionians islands and Crete (which, nevertheless, fell to the Turks in 1669) to remain mostly detached from the Ottoman Empire. Its people—an impenetrable mix of ancient Lacedaemonians, Slavs and Latins—were never assimilated into Islamic rule, and their defiant palaces perched above the sea never had their double-headed Byzantine eagles removed. Here, Fermor wrote, was “a miraculous surviving glow of the radiance that gave life to this last comet as it shot glittering and sinking across the sunset sky of Byzantium.” Mani, therefore, explores wondrous connections in our forgotten Greek inheritance (it argues, for example, that Christianity itself was the last great invention of the classical Greek world). But Fermor’s philhellenism was not dryly bookish. It was intensely lived, filled with intoxication and carnal play. His contemporary and fellow Anglo-Irish philhellene Lawrence Durrell was, in so many ways, his kindred spirit in this regard. They were also close friends and had reveled together at the famous Tara mansion in Cairo during the war. Mani, in any case, stands naturally beside Bitter Lemons and Prospero’s Cell as love songs to the Greece of that era. 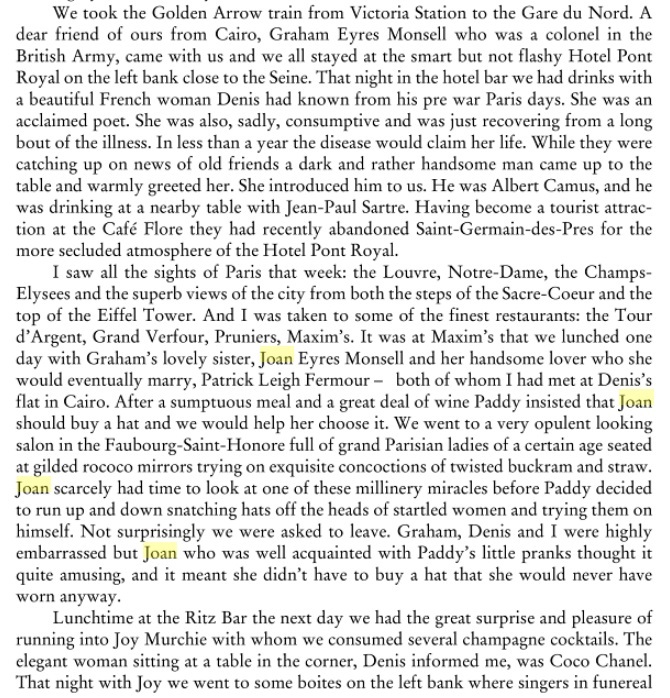 In Ian MacNiven’s biography of Durrell, we find an enchanting glimpse of a riotous Fermor visit to Durrell in Cyprus just after the war. The two men stayed up half the night singing obscure Greek songs, rejoicing in shared Hellenic lore and making a lot of noise. “Once as they went through Paddy’s vast repertoire of Greek songs far into the night, the lane outside the house filled with quiet neighbors, among them the usually boisterous Frangos, who told Larry, ‘Never have I heard Englishmen singing Greek songs like this!’ ” Their shared virtuosity in the Greek language was remarkable. Greece, for some of the young prewar generation, held a special magic. It was a youthful Eden, a place linked to the ancient world that was doomed to disappear in the near future. It’s a mood cannily incarnated in Henry Miller’s The Colossus of Maroussi, which records journeys that Miller and Durrell undertook together in 1939. But no one sang Greece more profoundly than Fermor, and no one tried more ardently to argue its core importance to Western culture, both now and—a more radical argument—in the future. Roumeli and Mani are his twin love songs to Greece, but it is in Mani that he most eloquently lamented the disappearance of folk cultures under the mindless onslaught of modernity and celebrated most beautifully what he thought of as an immortal landscape in which human beings naturally found themselves humanized. This entry was posted in Paddy's Death, Paddy's Houses, Profiles of Paddy and tagged Artemis Cooper, Deborah Devonshire, Greece, Joan Leigh Fermor, Kardamyli, Patrick Leigh Fermor on March 22, 2013 by proverbs6to10.